If you are new to dog or animal clicker training (even if you are very experienced in other dog-related areas), we have created a crackerjack Foundation Curriculum just for you. 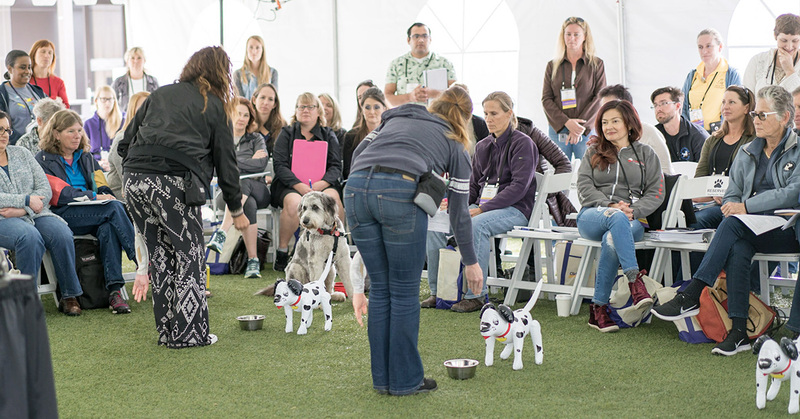 The Foundation Curriculum maps out recommended dog and animal clicker training courses for all three days of ClickerExpo, with a productive mix of Learning Labs and Sessions. Note that there are more course options, and that courses get increasingly advanced as you progress! Please refer to the narrative description Should Beginners Come to ClickerExpo? for additional information about attending ClickerExpo as a novice. There are so many opportunities to learn at ClickerExpo—even beyond the scheduled Sessions and Learning Labs. Book your spot at the Networking Roundtable Lunches, where you will have the opportunity to dive into topics of mutual interest with faculty members and fellow attendees! For more on lunch and other mealtime activities, click here. Attend this Orientation and then follow up with the general Opening Session at 9:00 am! Understanding behavior chains is critical, so we recommend you take both this Session and the Lab Train that Chain: Behavior Chains – In Action! If you are working with horses, you will find this a great alternative way to cover more about using clicker training with horses in particular. Dogs should already understand the click/treat relationship and should have at least five fluent and reliable behaviors. Dogs should be able to work in close quarters with other dogs. Handlers should have some experience with shaping. You may participate with your dog or you may attend as an observer. Observers should not bring their dogs to the Lab. To participate in this Lab, you are expected to attend the prerequisite Session. Shaping, a critical skill, is covered extensively on Day 2, but this course would be good choice for someone who might miss Day 2. The day starts at 8:00 am. Check out the Portland and Washington DC programs and choose any of the 8:00 am courses that are of interest! Cueing is a critical component of clicker training. We recommend that you attend the Session and the Lab What a Cue Can Do. Dogs need to have at least 2-3 behaviors on cue, be comfortable with normal handling, and be comfortable working in close quarters with other dogs and people. Any dogs that seem overly stressed or disruptive will be asked to move to a far corner of the room or asked to leave. Handlers need a minimum of foundation-level clicker training experience. You may participate with your dog or you may attend as an observer. Observers should not bring their dogs to the Lab. To participate in this Lab, you are expected to attend the prerequisite Session. Looking for a way to connect the dots between other horse training paradigms and clicker training? This would be a great choice for horse trainers. 11:00am - 12:30pm The Learning Planet (Washington DC) - Susan G. Friedman, Ph.D. Need a little wonder and inspiration? See how the principles and practices you are learning apply to the wider planet’s organisms great and small. Shaping is a critical component of clicker training. We recommend that you attend the Session and the Lab on Building Behavior: Shape the Future. If your looking for an alternative to Shaping, the use of non food reinforcers is also a critical skill and too often overlooked so you can’t go wrong with this Lab either. Dogs should be clicker-savvy, have a robust behavioral repertoire, and regularly and effectively use toys or play as a reinforcer already. You may participate with your dog or you may attend as an observer. Observers should not bring their dogs to the Lab. Dogs should already understand the click/treat relationship, be comfortable with normal handling, and be able to work in close quarters with other dogs. To participate in this Lab, you are expected to attend the prerequisite Session. You may participate with your dog or you may attend as an observer. Observers should not bring their dogs to the Lab. If you skipped the Shaping lecture, then this course, which addresses a challenge that newcomers sometimes face, is a great choice. If you skipped the Shaping lecture, or your brain is tired, this course, with interplay among our faculty in a live on stage discussion is bit fare interlaced with cool backstories and pearls of wisdom. Washington DC – Michele Pouliot & Susan G. Friedman, Ph.D.
“Off the Cuff” has become a ClickerExpo favorite since it began three years ago. The talk offers a unique opportunity to sit back and relax while two faculty members have an impromptu and candid conversation, off the cuff. This year Michele Pouliot will join Ken Ramirez in Portland and Susan G. Friedman, Ph.D. in Washington DC to talk about everything and anything that comes to mind in an unscripted, spontaneous and insightful conversation. If you attended “Train That Chain” on Day 1, this course provides you that next level of skill and understanding about chaining. Back-chaining is a linchpin skill for anyone training behavior that will will have multiple parts. Practice and build the skills you’ve been learning without your dog being the guinea pig! Both enlightening and fun. The use of non-food reinforcers is another critical skill that is often overlooked, so you won’t go wrong with this Lab. If you attended the Shaping course, this is an awesome follow-up. Get a good look at where you can go next, duration, and learn how you can implement the principles and practices that build duration in shaped behaviors. Many people start out with luring as the main component of their training; it’s important to be able to make informed choices about when and how to apply that training. Dogs should already understand the click/treat relationship, be comfortable with and able to work in close quarters with other dogs (no reactive dogs please). Handlers should have experience with shaping via marker training. You may participate with your dog or you may attend as an observer. Observers should not bring their dogs to the Lab. 11:00am - 12:30pm The Learning Planet (Portland) - Susan G. Friedman, Ph.D. Need a little wonder and inspiration? See how the principles and practices that you are learning apply to wider planets organisms great and small. Super fun table game that let you experience being the learner and teacher in a simulated training setting. Settle in and have fun. Are you working in environments that may not welcome your use of positive reinforcement? “Mark My Words” is a discussion about how we use our positive reinforcement practices and principles to make our way in the world. 2:00pm - 3:30pm Please Sir: May I Have Some Have Some Food, Water... and Control? From Surviving to Thriving - Susan G. Friedman, Ph.D.
3:45pm - 4:45pm Your foundational journey at ClickerExpo is over! Now the world is your oyster. Choose from any of the Sessions that interest you in Portland and Washington DC. There is so much more! Check out the full conference program for Portland and Washington DC, featuring more than 75 courses. ClickerExpo kicks off on Thursday evening with a complimentary Welcome Reception. Join us for light bites, a cash bar and networking as you check in at registration and settle in for an exciting weekend. Plus, check out the latest and greatest at the ClickerExpo Store! At our networking roundtable lunches, you'll have the opportunity to dive into more detail on topics of mutual interest with faculty members and fellow attendees. An evening of inspiration and lively conversation! This seated dinner will feature a facilitated panel discussion among members of the ClickerExpo faculty. It will provide the opportunity to ask questions of the faculty members and network with each other.